Animal Crackers refer to a small baked cookie that is in the shape of circus or zoo animals, such as lions, tigers, bears or elephants. National Animal Crackers Day is a day that hopefully stirs up those special childhood memories – who didn’t love those small boxes of Animal Crackers we shared with our friends? 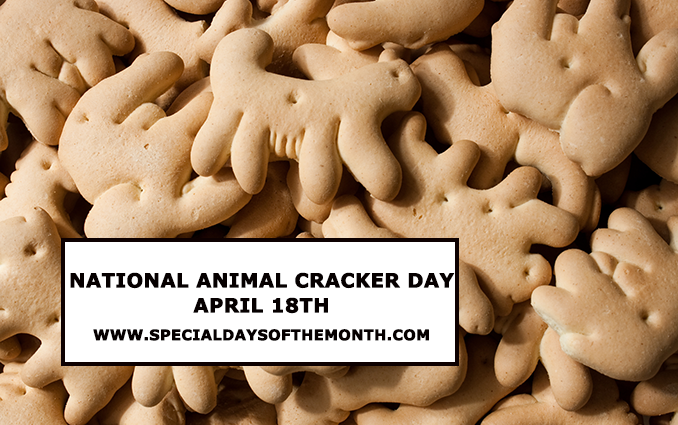 When is Animal Cracker Day Celebrated? Every year on April 18th. How is National Animal Crackers Day Celebrated? There are many animal crackers recipes including vegan and paleo. You can also crush the crackers to use as a crust for bars, use them as decorative toppings for cupcakes, dip them in chocolate or crumble into yogurt. Hand out boxes of Barnum’s Animal Crackers to your friends, children and co-workers. Stauffer’s Biscuit Company was the first to manufacture animal crackers in 1851. The famous Barnum’s animal crackers box was originally a Christmas ornament hung by a string. The string can still be found on boxes. These are the most popular brand of animal crackers. The original animal cookies or crackers were from England and date to about the 1800s. In 1902 a box of animal crackers sold for 5 cents! There have been 54 different animals created as animal crackers, 37 featured by Barnum. The latest animal to be added to Barnum’s crackers was the Koala, voted in by consumers in September 2002. Before Barnum’s small boxes, animal crackers were usually sold in barrels, hence the term “cracker barrel”.